The Best Free easy to use Secret Christmas Shopping List for the iPod, iPhone, and iPad. Secret Christmas Shopping List provides a much needed way to organize, and back-up your Christmas shopping list providing a common-sense way for you to keep your list safe from prying eyes. No need to worry about your kids, spouse, or friends stumbling across your Christmas gift shopping list anymore! With this app you can keep your Christmas shopping list private in one App! -Import content from any source within your device by way of copy and paste or simply write out your shopping list in text format. -Ability to email, text message, Airdrop, copy, or print your secret shopping List entries. -The App acts as a secret shopping list vault that will prevent anyone from accessing your secret shopping list. 1. REMOVE ADS: Make Secret Christmas Shopping List ad free! 2. 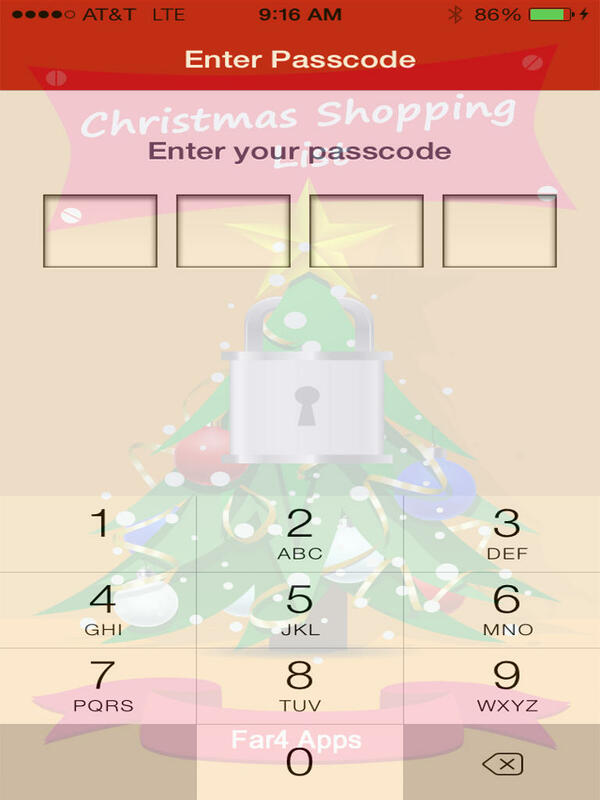 DECOY MODE: Use a fake or decoy passcode that opens a "safe" decoy version of the Secret Christmas Shopping List! Use this to show your kids a decoy "Christmas gift list"
3. BREAK-IN REPORT: Capture a shopping list intruder's photo, time, date, and GPS location and have it emailed with 3 failed passcode entry attempts! 4. QUICK HIDE: Quickly hide your Secret Christmas Shopping List with either 2 quick taps or turn the entire device face down! -All your data in this App is stored only in your device. We don't access or store your Secret Christmas Shopping List. We do not store or backup your passcode for app entry!